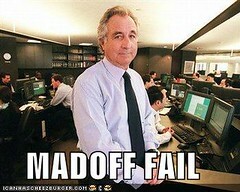 He may not have run a $50bn ponzi scheme but the domain name industry has found its Bernie Madoff. Yesterday, it was revealed that an employee of SnapNames, a popular domain name drop service and auctioneer, had been bidding on SnapNames domain name auctions, winning valuable domains, inflating auction prices and boosting revenue for the company in the process. All told, the employee, who was an early member of the SnapNames team and a vice president at the company, is said to have participated in 5% of SnapNames’ total auctions between 2005 and 2007 and that the value of his bidding accounted for 1% of SnapNames’ revenue during that time. Building a brilliant brand online requires a brilliant domain name but unfortunately, supply and demand aren’t in your favor when it comes to acquiring great domains. Trying to find a catchy .com can seem as difficult as trying to catch a fly. But that doesn’t mean that the perfect domain name is out of your reach. To the contrary: when you know where to look, finding the domain you’ve always dreamed of can be far easier than you might imagine.